Sweets do just as well on the grill as burgers. Here, six smoky, delicious desserts to make over Memorial Day weekend. 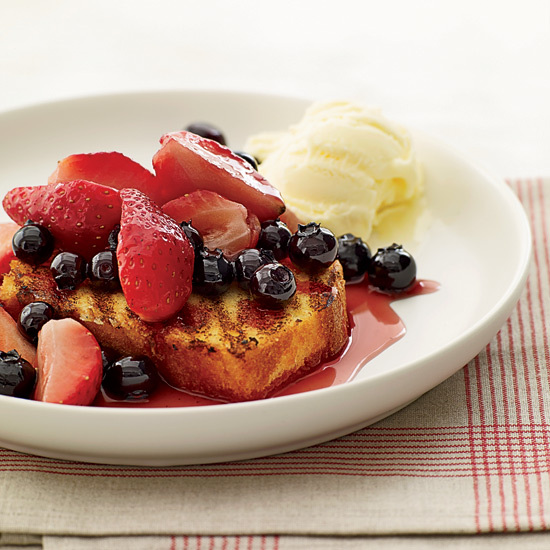 Berries grilled in a foil pack make an excellent addition to toasty pound cake. A dollop of crème fraîche or ice cream puts this dish over the top. This classic campfire dessert is ready in just 20 minutes. For these simple but delicious splits, bananas are marinated in rum, coated with sugar, then grilled until perfectly crackly on the outside. Caramelizing fruit on the grill intensifies its flavor. The grilled bread served alongside soaks up the sweet juices. This healthy dessert is a modern take on the traditional Greek combination of watermelon and feta cheese. This fun twist on the classic dessert features chocolate-studded biscuits filled with tangy raspberry jam and smoky marshmallows.